On November 3, 1965 (1410 UTC), a C-47 and two Beavers of the Argentine Air Force landed at the South Pole. It was the second time in a few years that Argentine aircraft made the trip from South America. The previous visit occurred on January 7, 1962, when two C-47s of the Argentine Navy arrived at the Pole. The leader of this year's expedition was Major Mario Olezza, Argentine Air Force, who piloted the C-47. His co-pilot was Lieutenant Carlos Bloomer Reeve. One of the Beavers was piloted by Major Jorge Munoz and Lieutenant Luis Cano, the other by Lieutenant Oscar Fontaine. There were nine additional persons aboard. The route followed by the aircraft was parallel to that used in 1962. Starting from Rio Gallegos in Patagonia, it extended by way of Robinson Island on the east side of the Antarctic Peninsula, where the Argentine Army and Air Force maintain a joint station, Teniente Matienzo, to General Belgrano Station on the Filchner Ice Shelf. 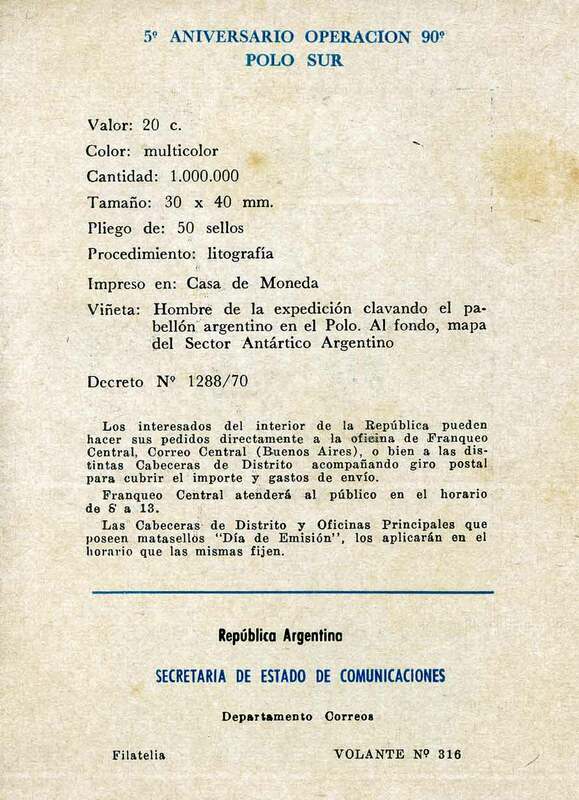 From General Belgrano, the aircraft made the flight to the South Pole. 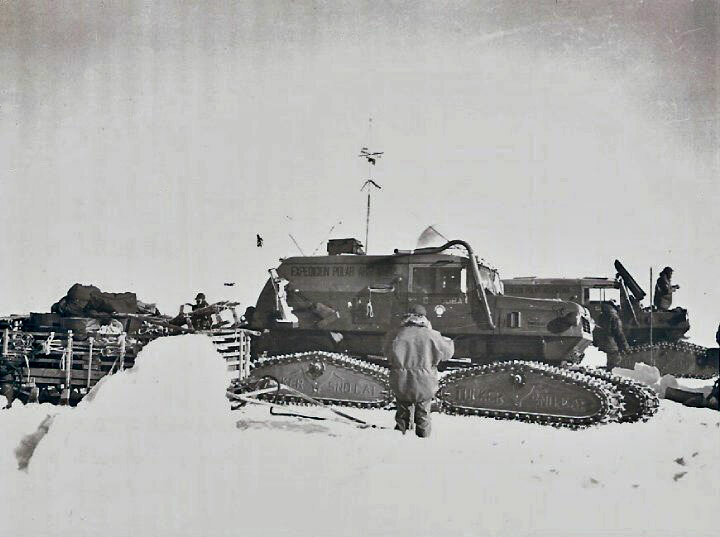 The arrival of the planes with 14 men on board raised the population of the South Pole Station to 52, about two and one-half times its winter complement. On November 10, however, the C-47, with all but four of the Argentines aboard, took off for McMurdo Station where United States Navy maintenance personnel assisted in the repair of an engine and the replacement of a wheel strut. On November 24, the C-47 departed McMurdo for Sobral, an Argentine station located at 81°04'S. 41°36'W. As it passed over the South Pole, the C-47 was joined by the Beavers for the return flight. The 800-mile flight from Belgrano took about 8 hours. The arrival of the two Beaver aircraft marked the first single-engine fixed-wing landings at Pole. The Beavers did not continue to McMurdo, but waited at Pole because of the cold (-60°F/-51°C) and joined the C-47 as it flew over Pole on the return flight to Sobral. Later in the summer, an Argentine Army ground expedition arrived. This was Operación 90°, the first Argentine ground expedition to the South Pole, led by then-Colonel Jorge E. Leal. The venture was scientific, but it also was intended to confirm Argentina's claim to their segment of Antarctic territory...accordingly it was conducted with some measure of secrecy. 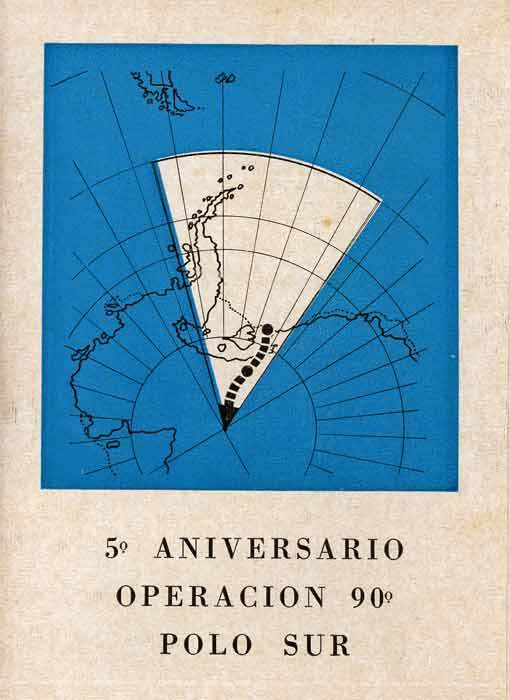 The ten-man round-trip traverse left from Belgrano 1 (77º46'S-38º11'W) on 26 October with six Sno-Cats and a scouting team of 4 men with 18 dogs (who went as far as 83ºS). The traveled a meandering course across the Filchner Ice Shelf to Sobral (81º5'S-40º31ºW--Argentina's southernmost base). 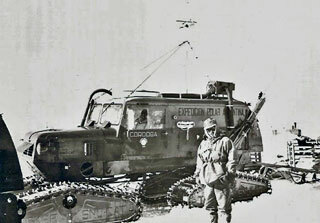 From there they proceeded straight south with (I believe) 3 Sno-Cats and reached Pole on 10 December. One comment on the trip by leader Jorge Leal was that the group encountered a radar operator from the United States who (since the secret visit was unannounced) asked them who they were and what they were doing there. After it was determined who they were, they were invited to dinner at Pole -- the first good food, said Leal, that the group had had in some weeks. The traverse team erected a flag mast at the geographic Pole...interestingly this now-lost marker (and not the Ceremonial Pole) is designated Historic Site and Monument No.1 (HSM No. 1) within the Antarctic Treaty System. Below, two photos. 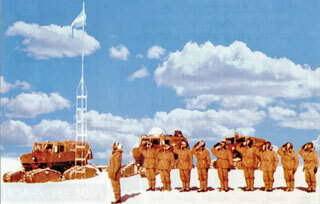 The ten-man team salutes the Argentine flag, with their Sno-Cats in the background (public domain photo by the Argentine Army from the Wikimedia Commons). 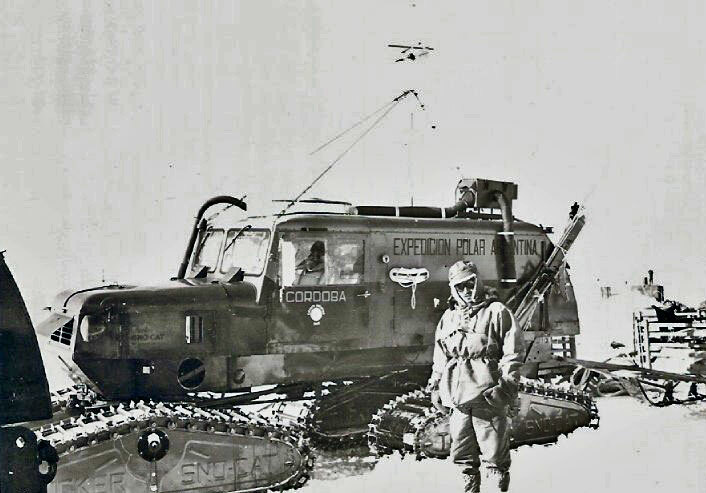 Here's a good view of one of the Argentine Army's Sno-Cats (and here's another photo of the other side of that vehicle and some of their other equipment). These photos are from 1966 Pole winterover Cesar Ambalada. After 2 days at Pole, the team headed back to Belgrano, which they reached on 31 December. 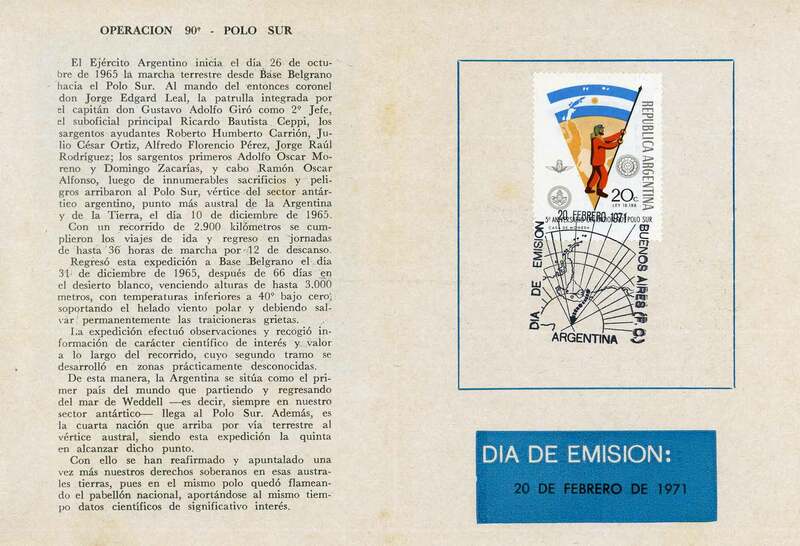 Some of this information is from a 5th anniversary stamp cover which Argentina issued in 1971. The map image at the top of this page is the first page of the cover folder; here are the interior pages and the back page (Spanish text). Also see this Wikipedia page about the expedition and this Operación 90 report by Col. Jorge Leal (in Spanish) from Fundación Marambio. One detail not mentioned above...the distance covered. I've found conflicting information...the stamp cover document mentioned above, as well as A Chronology of Antarctic Exploration (Headland, 2009) describe the return distance as 2900 km (1802 miles); Col. Leal's report states the distance as 2980 km (1852 miles); Antarctic (the journal of the New Zealand Antarctic Society) March 1966 implies a significantly shorter distance, perhaps closer to the straight line distance.